As a new mother, I was immensely saddened and attracted to this subject simultaneously. Why does Fort Worth (my hometown) have such a high rate of infant mortality? I found some answers. And more questions. But if one baby is saved because of this story, it was worth every word. My baby kicked and moved until the day he died,” said Jodie Kennedy. She thought everything was fine. It was her second pregnancy. But her amniotic fluid was leaking, making her feel weak and dizzy all the time. She didn’t know that what was happening was out of the ordinary, and she didn’t have a doctor to tell her it was. It was 2007, and Jodie had just relocated to Fort Worth from New Orleans after Hurricane Katrina. The young mother didn’t have money for a doctor and didn’t know how to apply for Medicaid. So when she was four months pregnant, her son died. If Jodie, 29, had gotten medical care early in her pregnancy, a doctor would have seen that her cervix was too weak to carry the weight of the developing child and could have given her injections to prevent premature labor. She knows that now because she delivered a healthy baby girl last summer. This time, with help from a federally funded program operated by a local charity, she went to the doctor right away and got the care she needed to carry the baby to term. These days, health officials and charity providers in Tarrant County are trying to turn some sad knowledge into power to help save the lives of more babies in North Texas. According to the most recent statistics available, Fort Worth has the highest infant mortality rate in the state, meaning that a higher percentage of babies here die before their first birthday than in any other major city in Texas. But it’s not just Fort Worth — the North Texas region in general leads the state in infant mortality as well. Fort Worth, Arlington, and Dallas had the highest infant mortality rates of Texas’ large cities: Fort Worth had 9 infant deaths per 1,000 live births compared to 8.2 in Arlington and 7.5 in Dallas. The problem also seems to be getting worse. 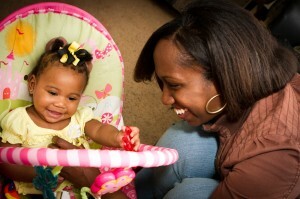 In January, the Tarrant County Public Health agency released its most comprehensive report to date on infant mortality. It showed that the number of infant deaths in both Fort Worth and Arlington increased in 2010, even though the total number of babies born decreased during that year. The causes of infant mortality are complicated, and none of the health officials contacted by Fort Worth Weekly would hazard a guess as to why North Texas cities seem to be so dangerous to the health of fetuses and newborns. Some of the conditions that lead to infant deaths here carry out the same theme as elsewhere in the state: A mother’s long-term lifestyle affects her chances of having a healthy baby — infant mortality rates are higher for obese women, for instance. Mortality rates also tend to vary by race. But at least one key factor here seems clear: Tarrant County has the worst percentage in the state of pregnant mothers receiving prenatal care. Premature babies are more likely to die shortly after birth than full-term babies. Moms with sexually transmitted infections are more likely to lose their babies. Both those factors trace back to a lack of medical care during pregnancy. And the medical care picture for women, particularly poor women, isn’t getting any better in Texas. The legislature has drastically cut state funding for family planning and women’s healthcare in recent years, leading to clinic shutdowns across Texas, including one in Arlington. When the state’s ban on funding for Planned Parenthood clinics led the federal government to end its women’s health program in Texas, state officials organized what they said was a replacement program. But that program has been criticized in Tarrant County and elsewhere for providing a much lower level of accessible care than in the past. And local health officials said Texas rules make it difficult for poor pregnant women to qualify for Medicaid. “The painful truth is, many women are going without preventive healthcare that could save lives,” said Danielle Wells, a spokeswoman for Planned Parenthood of Greater Texas.